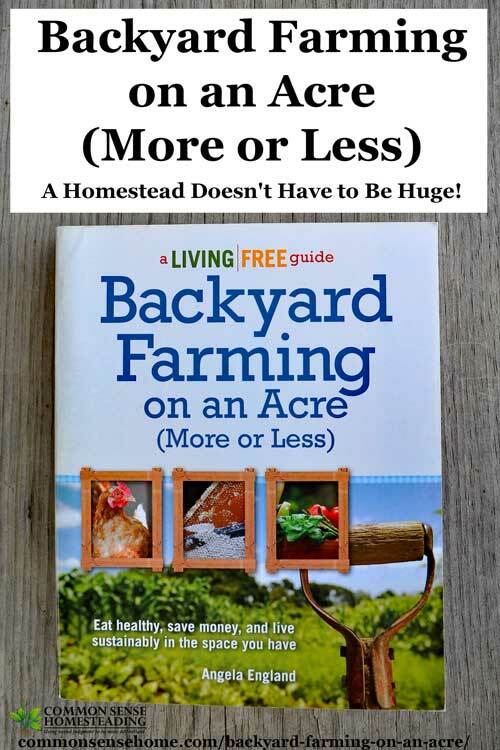 Backyard Farming on an Acre (More or Less) by Angela England is a homesteading guide written with the enthusiasm of a beginner and the experience of several years of homesteading with limited space. It's a great pep talk for those new to the idea of self-sufficiency who are wondering if they can raise more of their own food without moving to the country. Each of these parts is divided into subsections. 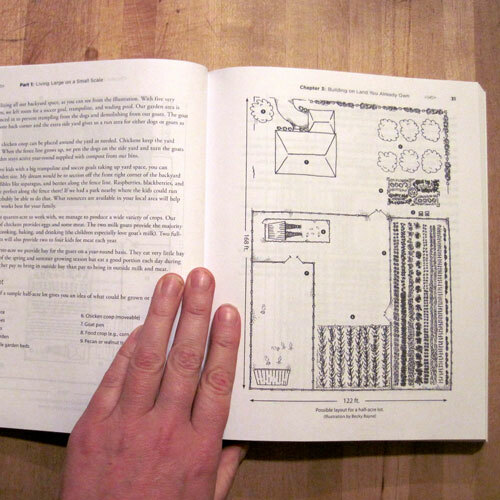 There are also appendices featuring Simple Plans for the Backyard Farm, Gardening Journal Pages and Resources. Angela features a taste of a *lot* of different topics, so there's something in this book for nearly every interest level. She's got some nice drawings in the beginning of the book to give the reader ideas about how much can be worked into a typical suburban back yard. With a supportive spouse, Angela tackles fence building, gardening, food preservation and many other tasks that can help you provide your family with fresh food no matter how small your space is. There are a few seasonal recipes to get your thinking about eating from your garden instead of from the grocery store. She moves beyond the basic chickens discussed in many small scale homesteading books to an assortment of backyard animals. There's a nice tutorial included from Baker Creek Heirloom Seeds on how to properly save tomato seeds. (They need fermenting to remove the outer seed covering.) She defines basic terms in many of the sections so that those unfamiliar with the topic will be better able to understand the discussion. I was glad to see that she included medicinal herbs as well as culinary herbs, as these are also left out of many garden planning books. Even though the book contained a lot of information, there were many areas that could have used deeper explanations, recipes or at the very least relevant online links. For instance, there were multiple photos of how to make a lavender wand, and only one photo of how to butcher a chicken. Granted, most of us would find the wand far more pleasant, but if you need to butcher a chicken, you'd better have a different book or some other source of information. 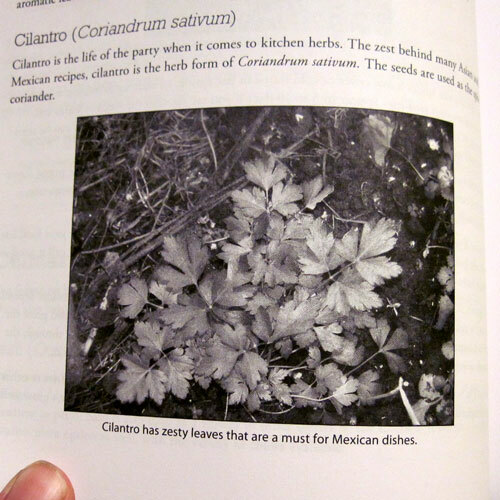 I know this cilantro should be a popping bright green instead of gray. I'm also pretty sure my old neighbors in the suburbs would have had kittens if I had tried to transform my yard as she suggests. Some of them had panic attacks just because we had a garden and an assortment of fruiting plants. Critters would have sent them off the deep end. Hopefully your neighbors will be more understanding. No matter how much or how little land you have, this book will help inspire you to look at your space in new ways. You don't have to do everything – you can pick and choose what fits for you and your family. I think Angela did a nice job creating a beautiful book to help inspire a new generation of homesteaders. Just got into gardening recently and I would love to add this book to my collection. Good luck all. I would like to learn more about how to garden with little space. I live in a city and have a small backyard that has a large tree in the middle. We’ve done a few gardens and it’s hard to get the type of produce I would like to grow in the amount of space we have. Thanks for your blog and all the wonderful advice! I really want some chickens! I would love to win this book you are offering as it would help up greatly on our 5.29 acres of land. I need to get better at composting! My soil is absolute crap and my plants don’t grow because there are no nutrients! I would love to learn good ways for northern/cold climate gardening that isn’t expensive. I would like to learn more about starting my garden plants from seed and then caring for them till planting. Thank you for this great review. The giveaway is a bonus 🙂 I appreciate that you also put some negative things about the book. Too many people only praise. I would like to know how to fit everything I need on 1 acre!! I want to learn about how to grow the largest amount food in a small area. I own a little over an acre. This is exactly the kind if book I’ve been looking for! i want to grow a medicinal herb garden and would lov eto grow all of my veggies and fruit that I can. Actually I am very interested in chickens and beekeeping. I currently have a backyard garden and am teaching my 3 children where good healthy food comes from. I would love to learn how to harvest my own seeds, How to enhance my compost by keeping animals, how to can and store the foods I grow, and how to elimanate unwanted pests organically, rather than by using chemicals. I can’t wait to read the great things you have come up with to help my small garden space more fruitful and productive. Making a garden space more efficient and workable. I would like to learn more ideas about efficiently using my space, especially in integrating animals like goats (beyond the chickens I’ve already had). I *am* microfarming on one acre…but at least mine is rural and the neighbors won’t complain about the critters. Would love to learn more about meat goats. I live on a rocky ridge top but have managed two gardens by building up soil and raising chickens. I love the idea of a 1 acre homestead but when you don’t have flat land, good soil or a water source it’s difficult. I would love to know if there are books similar to this that discuss how to manage on hilly, rocky terrain where nothing is level, no pastureland, etc. If you come across anything like this, please call it out in a post or Facebook. Thanks! I would love to add more variety of vegetables/fruits to my very small garden, as well as adding a few animals. Thank you! This is a great giveaway. Could not come at a better time. From your review I know that I would dive right into this book. I have been looking for land for the purpose of homesteading as we can no longer rely on the government to take care of us, it is time to stand on my own two feet. As a result of that, I think that a book like this would be a great addition to a library whose purpose is bring agriculture and self sustaining living back to the forefront of the game. Whether i win or not. This looks like a book i want in my collection. Thank you for sharing. I’m the proud owner of handmedown copy of Richard M Bacons “An Acre and Security”, and I think that this would be the obvious, perfect pairing as far as my situation is concerned. He is very through, covering everything from goats to compost to chicken coops and treating bugs in your garden, but from my perspective (greeeeen, green, greenhorn), I can’t have too much help) working around three kiddos (all old enough to ‘help’ a little) and very limited resources, I am always excited to investigate new methods. Would love to enter. How to? dev – can you see the rafflecopter widget at the bottom of the post? You just click on the different tabs in the widget and enter your contact information so we know how to reach you if you win, then do each of the optional activities to get additional entries. Your information will never be sold. What I need to learn is to how about going changing your town ordinances so that you can raise chickens in your backyard. I would so love to have my own eggs. Sounds like a good book, I have 3 acres and I think I could learn a few things from this. Perfect timing for a perfect book for this season! I would like to be better at planning and not wasting a garden for ALL year. Great give away. Would love to have a copy of this book. I’m interested in learning more about doing some gardening in pots (in addition to our regular garden plot). We don’t have a lot of sunny land so I think I need to try more in pots in our sunny spaces. I have a small piece of land and have been working to use every inch of it for gargens, fruit trees and this spring Chickens and some bee hives. I am currently trying to talk my husband into tearing up the front lawn to put in a blueberry patch. I would love to add this book to my collection, for some fresh ideas. We grow a huge garden and are planning to enlarge even more. Also want to raise chickens the most efficient way. I would like to know how to feed my chickens so they get the best non-GMO nutrition possible so we can get the best quality eggs from them. This looks like a great book! I don’t feel like I am optimizing our 2 acre homestead, so reading this book might be what I need to improve on this. Animals aren’t allowed where I live so I’d like to learn more about bigger gardens, fruit & nut trees and how to harvest and preserve the food. I’d love to know more about fitting more food-growing plants into less space. We live on 4 acres, but much of it is wooded and very few parts of the yard get truly “full sun,” so I have to be creative about how I plant things to maximize my harvest potential. I would LOVE to learn more about making the most use of my space. I have noticed positive health changes with trying to eat mostly organic, but it’s expensive…. would love to learn how to “stuff in a bunch” in a small space. I truly enjoy learning homesteading tricks, crafts and more to help us live more independantly !! I would like to learn more on seed saving. Thank you for the giveaway. I would love this book! I’d like to learn more about gardening and raising chickens. I’d like to know more about root cellaring/food storage options, and about having a family cow. This looks like a very informative source for those of us just really starting out in homesteading. I have a few more than one but only about one acre to actually ‘farm’ on! Thanks for the review! We have a nice size garden in the back yard, but we would like to expand it with corn, potatoes and onions. We also have a big bank that we would like to grow things on and any info on this would be very helpful (veggies, berries, etc.). Right now there is a lot of weeds and unwanted shrubs on the bank that need removed without hurting the soil. Also we want to build a grape arbor. And I could go on and on with a little livestock. Would love to learn about all the different things i can do my our land. We got a spare acre I can convince the hubby to let me use. Ooh, I just found your website yesterday and I love it. Thank you for sharing all of your wisdom and insight into homesteading! Such a great resource for those of us just getting started. More and more people are realizing this is the way to go for GOOD healthy food! We grow a lot of fruits and vegs, would love to learn more. I wouldn’t even have an acre if I knocked out a garage, but I could try! I’d love to see some specific tips on gardening in small spaces or vertical growing spaces. Each year we learn more about growing and raising our own food, and I become more and more convinced that it will be better for my family. I would like to learn about growing fruits and raising bees and small animals, as well as how to get more from our garden. Thank you! I want to learn more about homesteading on a smaller scale in general! I would love to learn how to live off the land more, with wild edible plants, medicinal plants, etc. I would so love to learn how to fit all of that on an acre, plus I would love to learn more about raising and taking care of animals. I’d like to learn more about vegetable gardening. I am HOPING to reform my BLACK thumb to a green one! This book had piqued my interest and have been thinking about getting it. Thanks so much for the review. I’m really interested in getting some backyard chickens. 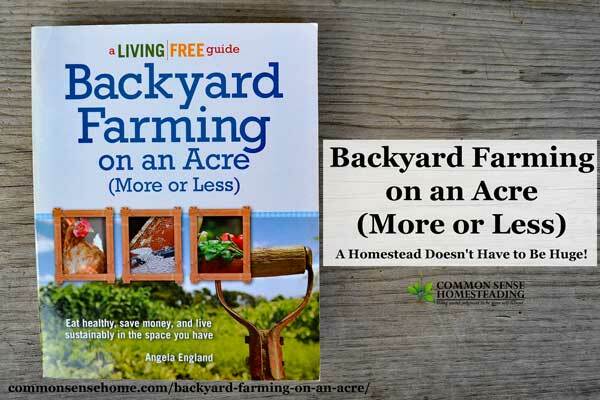 We have an acre and are barely using it…I’d love to win this book! What an awesome giveaway! I cannot say there is any one area I want to learn more about above others. I need to learn it all! I have a 2.5 acre homestead that is just waiting for me to start on come spring and I need to learn all I can before it gets here! I want to learn more about sheep vs. goats on a small acreage (2 acres), maybe meat breeds that are good milkers as well. also how to better utilize the space I have. I want to learn canning. This looks like such a useful book. I love diagrams. I know the children would put it to VERY good use! I have 1/3 acre and would love more info on converting my entire home and yards to a ‘farm’. On my way, but n\more info is always better! I would like to learn more about gardening all year round. I would like to more about gardening. Just getting started so this book would be a great primer to point me in teh right direction. I would like to learn about chickens and bees! Both I know very little about. I am always looking for ways to use our 1/2 acre in town to the fullest. Being a “maker” is something we always strive to be! I want to learn how to organize our acre. I want bees and chickens. I want advice on managing all this and the garden. 🙂 thanks for hosting the giveaway! Growing in the harsh Southwest desert is my big challenge. My “frost zone” is 11. Charts don’t even go up that far! I would like to know more about cold frames!! Thus extending my growing season. We’ve just purchased our own acre and a half and I can’t wait to get started! And chickens are on the list! Also picking the best spot for each thing we want to do….garden, herb garden, chickens, orchard, etc. Thanks for another great giveaway! And I am in the process of doling out the cough syrup I made from the herbs I won…THANK YOU for that from me and my kiddos! I want to learn about vegetable gardening, canning, composting, and how to raise chickens. I have been eyeing this book for a while. It would be great to reference as we just moved into a new house with a huge back yard! P.s. I’d like to learn more about highly efficient gardening in back yards. And canning…. I have been wanting to add this book to my collection for some time now, I hope I win. Thanks for the giveaway! I would like to learn about raising chickens. would love to learn more about getting the most out of a urban yard. Everything, I want to learn everything about self sustaining on our little 1.3 acres! Fingers crossed. I would like to learn to become more self sufficient and less dependent on factory farmed foods. Thanks for having the giveaway! I’d like to learn how to raise chickens. I would love to know about making soap. I want to learn it all!! We just moved in to a new home with a great big backyard and I want our own kitchen garden, chickens, the works! I would love to learn more about the animals you can raise in a small space. Seeing as I only have a space of .75, I would love to figure out to better use it!! Also, I liked the fact that in your review, you named both the pros and cons of the book. We have a large family so having a garden, growing our own food, would be very helpful. I would love to learn more about this! I’d like to learn more about raised bed gardening and planting more herbs in small places. I would love to find out more about being self sufficient. I’d love to learn more about gardening, especially in a small scale! We currently live in a townhome so we don’t have a lot of extra space and no yard to utilize. We just cleared an acre of woods so we could have a garden. I would LOVE this book to help me plan. I would love to know more about dehydrating and using the dehydrated foods. Also raising sheep and goats. We have a garden and raise chickens for eggs, but I am always looking for ways to maximize the amount of food we can produce ourselves. Awesome giveaway I would love to learn how to make more use of our space. Cant wait to get my garden started. I can always use tips!! I would love to learn more in every area of homesteading! I LOVE books!! I absorb whatever I can find about homesteading, farming, animal husbandry, caring for orchards (pruning, organic pest controls, etc. ), just anything and everything about it. My greatest dream is to have a farm and live a much more healthy and self-sustained life. To live off the land and learn more about how to give life back to the land. For now, I’ll start in my own backyard, and keep my hopes alive about someday moving on to something bigger! I’d like to learn more about canning. Seems like such a great way to store food. I’d like to learn more about raising animals on a backyard farm. Does the book have anything about pollination or beekeeping? Yes, there is a section on beekeeping. I want to learn more about what plants grow good next to each other. Thanks for a chance to win. I would love to learn more about animal raising on the one acre farm!!! Looks like a great book to own, thank you for the review on the book, and giving me a chance to win my own copy. I would love to learn more about livestock processing. I remember watching my grandfather kill his chickens, and my grandma cleaning and cooking them, but it would be great to know how to handle pigs, goats, etc to make the very most of what we have raised to eat. Vermicomposting- Worms provide the best natural fertilizer known to man. my husband and I are have been trying for a couple of years to be more self sufficient, We don’t have a lot of room and hope that something like this book could help. I’m really interested in learning how to get involved in vermacomposting. Just purchased our own home beginning of 2012 and would love to learn how to garden. Fermenting tomato seeds??? I would love to learn more! Sorry, itchy send finger,,,, I want to learn about greenhouses, raised bed gardens and growing herbs! I need to learn more about composting!! Though I wish I could raise chickens here in our rural village it is forbidden. Since Plan B is to learn more about raising rabbits in our back yard the book would be a helpful resource. I love learning more about the garden – especially how to best use all the things I grow. Thanks for offering this great looking book! Sure would like to win this book! Looks right up my alley! Sounds like an interesting book. We are attempting to have a homestead but can’t have animals. Maybe the lack of chicken-butchering pics would be good for us if we won this book. I would like to learn more about beekeeping. I would like to learn more about permaculture, rotational year round gardening and gardening in shady areas of the yard. I’m interested in backyard chickens. Thank you for this opportunity. We’d like to learn more about optimizing our space for homesteading. Would love to learn more about making the most of small spaces and animals on small propeties. I would like to learn more about growing seeds and hardening them off, especially tomatoes. I’d like to learn more on planning things out.. Personally I tend to get everything needing to be done at once and overwhelmed.. spacing things out would be nice.. I would like to learn more about growing fruit. I would love to learn more about providing for our family on a budget, growing our own food & herbs, raising chickens for eggs, etc. While I hope someday to have a larger area to “homestead” the reality is that I don’t know if that day will ever come so I would love to learn more about homesteading on a small scale! I would like to learn more about canning. I’d like to learn more about garden planning. I’d like to learn more about raising pigs for meat. I’d like to learn more about bee-keeping. I am devoted to growing food, not lawns and spreading the word. It is important to lead by successful example. What an interesting book. I don’t think out neighbors would appreciate it if we added chickens, but they have been great about our garden space. One neighbor’s granddaughter likes to come over and help pick (read as: eat every other one) beans with our kids. This is the first year I will be able to have a garden. I am very excited but nervous as well. I need help in all areas; herbs, fruits and veggies, composting, organic practices, etc. This book looks amazing! !